Gold is on the move. As the price of gold threatens to push permanently above $1,000 per ounce, it raises questions about why gold is becoming such a hot commodity and whether it truly is a safe harbor. There is no question that gold's price run-up is purely speculative. Since the beginning of 2009, the number of outstanding shares in the SPDR Gold Trust (NYSE: GLD), the most popular exchange-traded gold fund, has climbed about 33%. Demand for gold has increased significantly. There is something else we use every day that, like gold, has no inherent value: cash. Of course, there's a major difference between gold and cash: unlike the dollar, the nondollar value of gold won't be significantly impacted by the U.S. government  only its price in dollars via the government's impact on the dollar. And currency explains why gold has not yet made a clear jump above the historic high set a year ago  in U.S. dollars, that is. The dollar has appreciated enormously during the global economic slowdown. All else being equal, this lowers the price of gold for U.S. investors buying with dollars. Independent of the dollar, gold has actually increased considerably in value. Indeed, the prices of gold in euros, British pounds and Canadian dollars set their record highs, by a large margin, in 2009. The supply of gold is also a factor in pricing. Many investors holding gold reserves have faced losses in their other assets, which would have led them to sell their gold. Ordinary people, too, have motive to sell their gold jewelry during a recession, which should increase the supply of gold on the open market and impede a price hike. As a parallel, much of oil's decline in prices since the summer was spurred by speculators unwinding their positions, as they needed to liquidate to cover losses. But gold prices have not followed oil prices downhill. It is clear that new money has entered the gold market. Many who sold their stocks and other assets have reallocated into the gold market, instead of leaving it to cover losses. In the face of appreciation of the dollar and a financial meltdown, dollar-denominated gold has still managed to hang in there, near its high. Speculation remains rampant. But the speculation in the gold market is nothing like speculation in other markets. Unlike oil, gold is not consumed, and even when it is used in products like jewelry, it is recoverable and thus maintains its value as the gold that went into it. In other words, the total supply of gold is increasing with gold mining. Most speculation is motivated by the desire for profit. It seems that recent interest in gold is instead motivated by the desire to maintain value. After all, the price of gold in dollars has not shown a steady return. As the government continues to enact costly but what many believe to be inadequate solutions to the financial crisis, investors fear the worst for the future of the economy and the the dollar. Thus, the price of gold has become a measure of confidence in the government to handle the crisis. Traditionally, gold has been a store of value when citizens do not trust their government politically or economically. In Asia, ordinary people not investors by any means  historically have held tremendous amounts of gold in jewelry. Now that same concept has extended to more-sophisticated investors, who hold gold not in jewelry but in bars and derivative contracts. 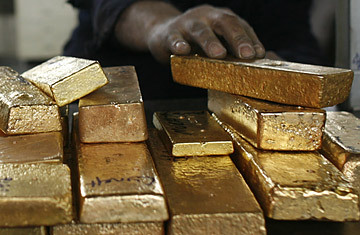 Gold, then, can be considered a currency, unique in that it is not directly tied to any country's economy. With a global recession that is bound to continue to shake up the purchasing power of all foreign currencies, gold is safer from political and economic instability than cash. So is it time to put all your money into gold? That depends on your appetite for risk. The sheer amount of speculation in gold and uncertainty in the foreign-exchange market will keep gold prices as volatile and unpredictable (i.e., risky) as ever. Like any financial market, the gold market is susceptible to manipulation. But having a small percentage of your assets in gold could serve as a hedge against an exacerbated crisis. At the very least, hold on to your jewelry. Read TIME's 1998 cover story on the future of hard currency.